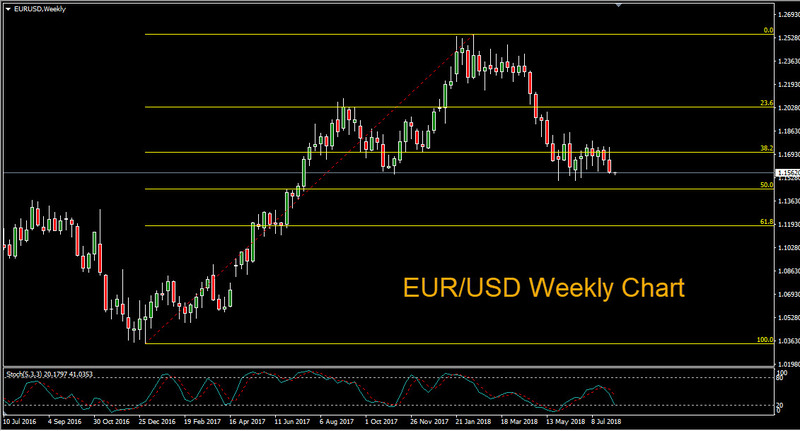 EUR/USD is under pressure with price coming precariously near the 2018 low of 1.1508 reached on May 29th. Price is confined within a descending triangle pattern and bears are looking for a potential breakout to the downside. Looking at the weekly chart we can see that price is nearing the 50% retracement of the upmove that began in January of 2017. This 50% retracement level at 1.1447 is a major support level and could be magnetic if price is able to breach the yearly low of 1.1508. The US employement report on Friday was mixed – nonfarm payrolls increased by 157,000 for July, missing expectations of 190,000. However, the unemployment rate fell to 3.9 percent from 4.0 percent in the prior month – reaching its lowest level in almost 50 years. EUR/USD traded modestly lower on the news and Friday marked the fourth consecutive day of losses for the pair. On Monday, German Factory Orders missed expectations for for the fifth time in the past six months. The headline figure came in at -4.0 percent vs. a forecast of -0.3 percent.